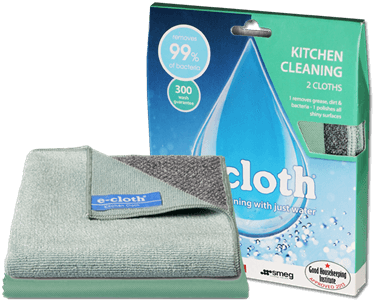 There is no need to struggle with those tough cleaning challenges, when e-cloth’s Kitchen Pack provides everything you need to tackle grease and grime on surfaces and appliances. 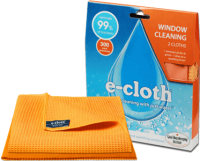 Our specialised cleaning and polishing cloth will leave them gleaming. The Kitchen Pack oﬀers perfect cleaning for all hard kitchen surfaces using just water. 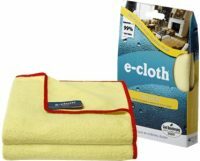 The pack includes a Kitchen Cloth to remove thick grease, dirt and bacteria. 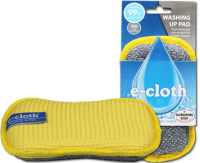 It features a unique, non-scratch scrubbing pocket, to quickly and safely remove any spots of more stubborn dirt. The Glass & Polishing Cloth provides the perfect ﬁnish on all shiny surfaces such as taps, toasters etc. Brilliant on stainless steel.